The SunStick is helpful in determining how much sun exposure different sections of your yard and garden actually get during the course of a day. SunStick won’t give you precise lighting measurements, but it will give you a better idea of just how much sun your plant will get in a particular spot, so you can choose your plants accordingly. Takes the guesswork out of sun exposure. Each disk is single use only. Partial sun or shade doesn’t specify the time of day. The starter kit comes with 3 reusable stems, 3 single-use meters, and a color chart. About $10 each. Refill packs contain 3 meters and a color chart. About $7.00 each. Available online. Should be available in garden centers for Spring 2009. A SunStick for houseplants is in the works. 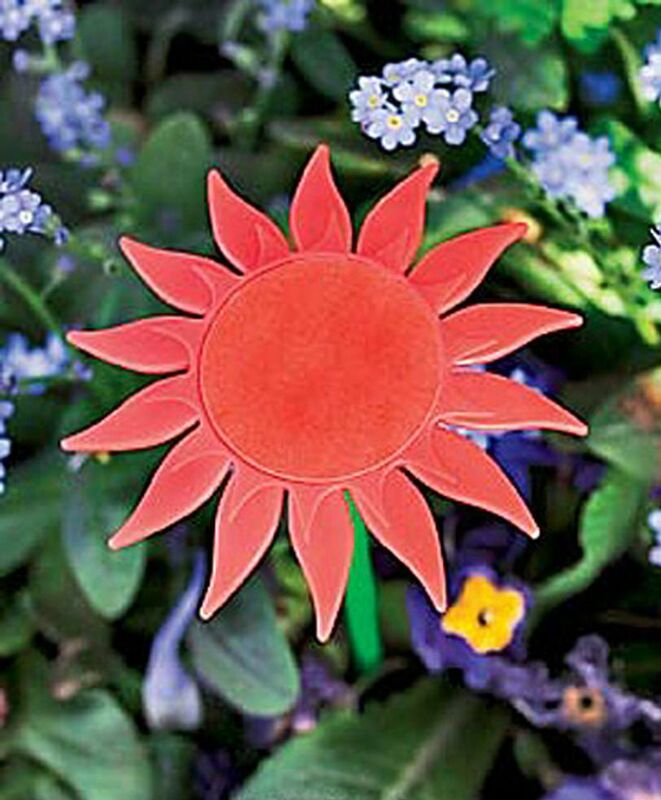 The design seems simple enough; attach a disk, or Sunshine Meter, to one of the plastic flowers and insert the flower in the ground where you want to measure the sun exposure. Somehow the disk reacts to the amount of sunlight that hits it during the course of the day and changes color to indicate either Full Sun, Part Sun, Part Shade or Full Shade. That’s it. By the end of the day, you’ll know what kinds of plants you can grow there. The SunStick is similar to another product on the market, the Sunlight Calculator, except that the Sunlight Calculator runs on a 3V lithium battery, so there are no disks to swap out. However, the battery will need periodic replacing. Also, the less expensive SunStick comes in a pack of 3, so you can do 3 areas of your yard at the same time. The SunStick is most accurate when used during the growing season on an average sunny day. You don’t want to put it out before nearby trees are in leaf or in bad weather. And make sure it’s not hidden under the plant’s leaves. To help you out once you have your measurement, their website lists dozens of common plants by their sun exposure needs. But since most plants come labeled for sun exposure and most gardeners are prone to impulse buys, it's a nice measurement to know before you go shopping. SunStick is also a nice learning tool for new gardeners. I found SunStick to be particularly useful for me in questionable areas, like that tucked away nook where I know some sun is getting in, but it’s nice to see whether it’s sunny most of the day or just when I look out. It would also help someone in a new home to avoid planting mistakes.